More than 900,000 bicycles in the United States and another 98,000 bicycles in Canada have been recalled after three injuries to riders. Trek Bicycle, a bicycle company, has issued the recall covering bikes from model years 1999 to 2015. The expensive bikes are manufactured in Taiwan and China. They are sold for anywhere between $480 and $1,650. The bicycles have been recalled because of a defect in the lever located on the front wheel. The defective lever can interfere with the disc brakes and cause serious injuries. Because the front wheel can at times detach from the bike, riders faces, necks and heads are at particular risk for severe injuries. The bikes have been sold all over North America for more than a decade and they are located in millions of homes. After reports of paralysis, broken wrists and facial deformities caused by Trek bikes, the company quickly issued a voluntary nationwide recall. If you own a Trek bicycle, you may be worried, and rightfully so. After all, the product has caused at least one person to be paralyzed permanently. If you own a Trek bicycle, the company is offering free replacement coupons for consumers who bring in their bikes for inspections. The coupon is worth $20 and will cover the cost of the replacement parts necessary to ensure that the bike is fixed. The Wisconsin-based company stated that the repairs would take less than five minutes to complete. In addition to the injured rider who became paralyzed, several other riders were injured. 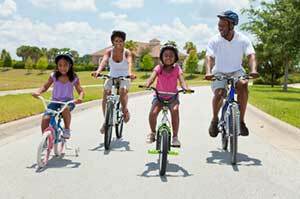 Phillips Law Group personal injury attorneys in Phoenix vigorously defend the rights of injured cyclists. If you or a loved one has been harmed in an accident involving a recalled Trek bicycle, contact our attorneys immediately. We assist injured persons living throughout Arizona, Utah, California, and New Mexico. Call or text 1-800-706-3000 to schedule a free consultation today.